We provide a broad spectrum of care and nurture to children from birth through fifth grade. Childhood is an adventure all its own. We wish to equip and support families to follow a course to shape both their minds and souls in a posture that will result in a life of worship. 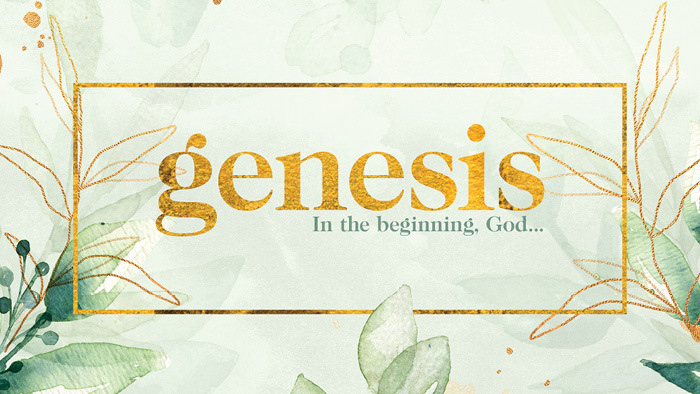 Every developmental and grade-level room provides an intergenerational experience as adult leaders, youth helpers, and children all journey together through a grand metanarrative of the Big God Story. Our goal is to help children understand they have a part in God’s Story and this faith community. When the church supports the family no one ever journeys alone. Collectively, we embrace a collaborative effort between the body of Christ, the gifting within, and the power of God’s Spirit. We believe that to grow spiritually healthy families, parents must be equipped to be the primary nurturers of their kid’s faith (Deuteronomy 6), that the faith community needs to play a supportive role in this endeavor (Ephesians 4), and that we must remain dependent on the Holy Spirit to bring about spiritual growth and formation when and as He chooses (Philippians 2:13). The passing of a baton of faith from one generation to the next is the role and responsibility of godly parents. It is our joy as a faith community to join with families in an intentional partnership that helps equip parents in their role as spiritual nurturers of their children’s faith and celebrates milestones in the parent-child spiritual formation journey. The following legacy milestones are recognized and celebrated: Child Dedication Service, Baptism, and 5th Grade Recognition. Check out the tab to find out more details. The church also equips parents by providing materials for families to use in the home to develop their faith in Jesus as a whole family. The curriculum we use for two year olds through the 5th Grade is a dynamic, spiritually-forming, and family-empowered ministry philosophy that offers a vibrant weekend experience, as well as other family resources that meet the specific needs of today’s generation. Our curriculum is uniquely developed to inspire, equip, and support parents and volunteer/leaders in their ministry to children. We strongly believe that spiritual development can and should begin from the earliest age with parents as the primary nurturers of their children’s faith. With this in mind, our resources support both the church and home with a focus on knowing God personally, igniting a passion for Christ, learning to listen to His Spirit, keeping biblical content true to context, and cultivating a concern for people’s needs in our communities and the world. If you have questions about our ministry and programming or how you might get involved as a parent, please contact the Children’s Ministries team. From helping in small ways, to getting in the trenches as a classroom lead teacher, we would love to have you on the team. Beginning 15 minutes prior to the service, parents may drop off their children. Sign-in takes place at the bottom of the north east stairs. Parents pick up their children immediately following the worship service. All classrooms are labeled and there is also always someone in the halls to answer questions. Any child on antibiotics should have been on the drug for at least 24 hours before coming to class. NOTE: Children’s Ministry Volunteers cannot administer any medication. 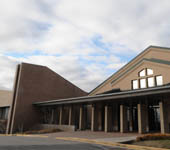 Beginning 15 minutes prior to the service, parents may drop off their children (Birth through Kindergarten at 9:00am and Birth through 5th Grade at 10:45am) Sign-in takes place at the bottom of the north east stairs. 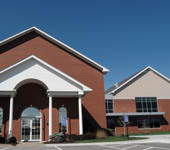 Welcome to Children’s Ministries at the Brookside Campus for the nursery, children ages birth through two years! The purpose of the nursery is to provide a safe, loving, fun, and comfortable environment for both child and parent. To accomplish this, our staff will walk, rock, read, feed, and play with the children to ensure that they are content. The nursery is made up of two rooms: Nursery (ages six weeks old to walking) and Walkers (walking age to 24 months). Each room is staffed by a team of two – four workers. For your child’s security, we use an ID label system. During check-in, matching labels are printed for the child and parent (adult) dropping off the child. The security (adult) label is required when picking up the child. Nursery facilities will be open approximately 15 minutes prior to regular church services and approximately 15 minutes after church services. Please label all personal items (including pacifiers and sippee cups) with your child’s first and last name before arriving at your child’s class. This helps us keep track of your child’s items. If it is your first visit to Christ Community, the staff at the Children’s Ministries Check-In kiosk will ask you to complete a first-visit registration form. You will be given a nametag sticker for your child and a security card for you. Please note the three-digit number on the security card. If your child needs attention, we will text you on the mobile phone number you leave with us during check in this case, please report to the room where you dropped off your child. Please complete a “Notes to Nursery” card with information that will help in caring for your child, such as feeding times, sleeping times, allergies, and special needs. A Nursery greeter will meet you at the door to receive your child, diaper bag, and any other necessary items. After you have completed the check-in process, simply wave a quick good-bye and leave for the worship service. As you know, it is normal for little ones to cry when parents leave. This does not last long, and separation becomes easier over time. Our leaders will immediately create interest in a toy or activity and give assurance that you will return. Please do not “look in” on your child, as it may cause him/her to be unnecessarily upset, as well as cause disruption to the other children. If your child cries for an extended period of time, we will page you by texting the mobile number you left for us, or by sending someone upstairs to let you know. Immediately following the service, please return to your child’s classroom. Please make sure all your child’s personal items have been returned to you before you leave the premises. It is our goal to provide a safe and secure environment for children. In order to ensure the safety and health of children and staff, children who have had any of the following symptoms and/or illnesses within the past 24 hours will not be admitted into class: fever, runny nose (anything but clear), questionable rashes, coughing, diarrhea, impetigo, active chicken pox, measles/mumps, pinkeye, vomiting, open sores. Any child on antibiotics must have been on the drug for at least 24 hours before coming to class. Staff will not administer any medication. Nursery bedding and toys are sanitized after each use. A minimum of two staff is required in each classroom. No child will be allowed into a classroom before two adult staff are present. To maintain appropriate staff/student ratios, all parents are encouraged to volunteer in their children’s classrooms. Welcome to Children’s Ministries at the Brookside Campus for preschool, children ages two years old through kindergarten! The preschool program at Christ Community strives to provide a safe and secure environment for children to experience God. Policies are in place so parents will feel comfortable when they drop off their child (two adults per room, teachers identified by name badges). We want to connect children to God by knowing Him (mind), loving Him (heart), and serving Him (hands and feet). Activities include: Bible story, Bible words, music, crafts, and discussion. Snack and playtime are provided during the service. Early Childhood facilities will be open 15 minutes prior to regular church services and approximately 15 minutes after church services. Please label all personal items with your child’s first and last name before arriving at your child’s class. This helps us keep track of your child’s items. Our mission is “to be a caring family of multiplying disciples influencing our community and world for Jesus Christ.” On Sunday mornings, Christ Community focuses on discipleship. In order to encourage elementary students to join the congregational worship upstairs, we provide “Kid Connect” pages each week with fun, thoughtful activities that help students engage with the teaching. This sheet is also family-focused. It contains activities to assist parents in leading their children in further engagement with God’s life-giving Word. You can find copies of the “Kid Connect” at the back end of the center aisle. We provide elementary programming during our 9 and 10:45am services. During this time, K – 5th Graders enjoy hanging out in the large central room in the lower level after they check in, and then experience meaningful worship and age-appropriate teaching by trained leaders who have a personal relationship with Jesus Christ. Beginning 15 minutes prior to the service, parents may drop off their K – 5th graders, or allow their children to sign themselves in for programming. Sign-in takes place at the children’s ministries check-in desk. Parents pick up their children immediately following the worship service.Our elementary classrooms are broken down as Kindergarten-1st, 2nd/3rd and 4th/5th. Our ministry team will also help you find the right classroom and answer any questions you might have.. Parents may sign an Early Release Permission Form (as the classroom teacher about this), which allows 1st-5th grade students on the Early Release list to be dismissed at the end of the service to meet their families at a prearranged location. The church equips parents by hosting orientations, parents’ meetings, family nights, and providing materials for families to use in the home. Find out out more about each milestone by selecting the topic below. Fewer things are more important to us than our children. God has blessed you with a child and the responsibility to be the primary nurturer of their faith. Alone, this task could be daunting. As a church family, we are here to support, equip and encourage parents as they grow in faith and pass it along to their child. Read Psalm 78 to fully grasp the intent of God’s plan for parents to be the spiritual leaders and how this is passed from generation to generation. Child dedication is a wonderful milestone celebrating identity and faith community. Each child is created in God’s image and they bear His fingerprint. The child dedication Sunday service embraces parenting yoked with God. It establishes a larger faith community who will surround your family and speak words of encouragement and partner in raising your child. The blessings shared during the service acknowledge a larger storyline that God is writing, which includes your child and the unique contribution God created for him/her to fulfill. In preparation for this important faith milestone, we want to gather for a meal, invite you to share your faith stories, your parenting desires and hopes, and come alongside you with prayer and resources for the parenting journey. We long for this to be a meaningful time for you as parents, growing in relationships with other parents, and with the Children’s Ministries team at Christ Community. Register for the orientation class online through the calendar or in the This Week email. Dinner and childcare are available the evening of the child dedication orientation. Join other parents for celebration and encouragement as we explain and answer any questions you may have about Child Dedication and explore the resources available for parents through Christ Community. Child Dedication will be part of our Sunday morning worship service. Invite your family and friends to join you for this special milestone. The beauty of baptism is that you enter into a family. Listen to these poetic words, written centuries ago in the Book of Common Prayer. As your child prayerfully considers stepping into the family of God, you remain essential to their faith. It has been through your modeling, serving, love, respect, and inclusion of your family in a faith community that has led them to desire claiming Jesus as their personal Lord and Savior. As the closest witnesses of faith for your child, we feel called to inspire, equip and support your family. When your child expresses the desire to be baptized, we invite you to fill out the Children’s Baptism Interest form. A Children’s Ministries leader will then schedule an evening to bring dinner and share in the baptism conversation with your family. Baptism dinners in the family home will be scheduled a month prior to the baptism dates. We will also give your family multiple resources that will continue to bring vibrancy to your family’s faith. We encourage you and your child to consider inviting a few special guests to the dinner that have been part of your child’s spiritual journey: a church leader, a family friend, or a grandparent. We are blessed to be on a faith journey with your child and your family. Prior to our baptism visit in your home, we invite you to share with your child this salvation path. Invite them to tell you about how they are feeling. Remind them this is the start of a journey, that following Jesus is a lifelong pursuit. Most of all, relay to them that baptism is an outward sign of an inward change and a forever relationship with God. Contact Anna Lynn Rolf with questions. 5th Grade Recognition is a service designed to celebrate, as a church family, a legacy milestone in a 5th grader’s faith journey. This is an important time for our students and their families as they transition from 5th grade to 6th grade, in many cases, from elementary school to middle school, and from Children’s Ministries to Student Ministries. A strong and committed faith journey happens with the successful passing of a baton of faith in the home—from parent to child—and a baton of responsibility for partnering with the home as a church—from Children’s Ministries to Middle School Ministries. This service celebrates both. 5th Grade Recognition happens on the 3rd Sunday in May each year. All Christ Community families with 5th Graders are contacted prior to the service. We value adults investing in the lives of our children. If you are interested in volunteering, below is a list to give you a general idea of what our needs are and what the role for each area looks like. To get more specific information on what is needed, and to volunteer for any of the below roles, please contact Anna Lynn Rolf, Director of Children’s Ministries – Brookside Campus. Supervisor: The Supervisor is responsible for making sure the volunteers are in place, equipped, and encouraged. They also greet visitors and direct them to their classrooms. This person is the point person for volunteers, parents, and children in Children’s Ministries. This is an hour-and-a-half to two-hour per week commitment on Sunday morning during one of the worship services. Check-in: The check-in volunteer is the first friendly face that guests and regular attenders see when they arrive at Children’s Ministries. This person is responsible for making sure that guests are properly cared for (fill out guest card, write out name tags for children) and that their information is properly put into the MyChristCommunity database. This person will also check regular attenders and volunteers into the manned check-in station. They also will assist anyone who needs help using the self-check-in station. This is a half-hour to 45-minute per week commitment on Sunday morning during one of the worship services, as they are free to go once everyone has checked in for the morning. Security Personnel: The Security Personnel volunteer will sit at either the south or north entrances from the time check-in begins (15 minutes before church) until all children are picked up. During the service, the security doors on the north and south side of the mezzanine level will be shut / locked. The security personnel need to make sure and listen for late-comers and parents who wish to pick up their children early. As much as possible, they will make sure that only individuals with a “security sticker” are permitted to enter the activity area or nursery area during the church service or when the children are being picked up, for the safety of our children. This is a 1.5 hour per week commitment on Sunday morning during one of the worship services. Curriculum Preparer: This volunteer uses the Brookside Campus resource room and pre-printed lessons to put together each classroom’s activities for the week. This is a 2 – 2.5 hour commitment that can take place any time during the week. Walker or Nursery Room Lead: Your responsibilities include leading all classroom activities; leading prayers; arriving 15 minutes prior to the start of service; greeting parents and taking children and their personal items into the classroom; nurturing children; changing diapers; assisting with cleanup; following strict security procedures; and following instructions on the Volunteer Checklist located in the room. This is a 1.5 hour per week commitment on Sunday morning during one of the worship services. Walker or Nursery Room Lead or Caregiver: Your responsibilities include arriving 15 minutes prior to the start of service; greeting parents and taking children and their personal items into the classroom; nurturing children; changing diapers; assisting with cleanup; following strict security procedures; and following instructions on the Volunteer Checklist located in the room. This is a 1.5 hour per week commitment on Sunday morning during one of the worship services. Preschool Teacher: The Preschool Teacher is responsible for caring for the children during the worship service. They teach the children the lesson, work through the application activity, and supervise snack time. This is a 1.5-hour per week commitment on Sunday morning during one of the worship services. Preschool Assistant Teacher: The Preschool Assistant Teacher is responsible for caring for the children during the worship service. They greet children as they enter the room, keep accurate attendance records, assist with application activity, and supervise snack time. This is a 1.5-hour per week commitment on Sunday morning during one of the worship services. Elementary Classroom Teacher: An Elementary Classroom Teacher greets students and oversees the class. Lesson preparation is required during the week (not supply preparation – cutouts, printing, gathering supplies – we take care of that) . This is a 1.5-hour per week (plus lesson preparation) commitment on Sunday morning during the 10:45am worship service. Elementary Classroom Assistant: An Elementary Classroom Assistant is responsible for greeting students, building relationships with students, keeping accurate attendance records, assisting with application activities, and supervising snack time. This is a 1.5-hour per week commitment on Sunday morning during the 10:45am worship service.